ED WHEELER & H.D. MURPHY, TEXAS TROOPERS NOT FORGOTTEN! There have been at least eleven movies made about the criminals who killed those two Texas State Troopers, but most people don’t have a clue of the Troopers’ names. Even worse, there were a total of nine law enforcement officers killed by the gang as they traveled through Texas, Oklahoma, Arkansas, and Missouri. It is doubtful most readers can name even one of those men who gave their lives. 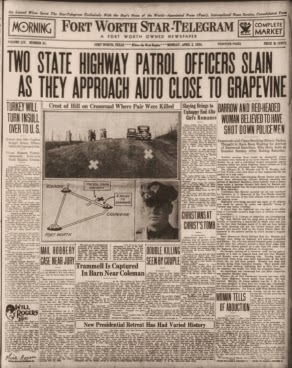 Eighty years after Wheeler and Murphy were killed on Easter morning, here are the names of the other seven murdered officers. Deputy Eugene Clyde Moore, Atoka County, Oklahoma, Deputy Malcolm Davis, Tarrant County, Texas, Detective Harry L. McGinnis, Joplin, Missouri, Constable John Wesley Harryman, Newton County, Missouri, Marshal Henry D. Humphrey, Alma, Arkansas, Major Joe Crowson, Texas Department of Corrections, Constable William Calvin Campbell, Commerce, Oklahoma. But back to Ed Wheeler and H.D. Murphy who stopped that Easter morning to help an apparently stranded motorist on what is now Texas Highway 114, in the Dallas area. They were ambushed and murdered without even pulling their weapons. It was Murphy’s first day out of training as a motorcycle officer. He remains the youngest Texas DPS officer to have lost his life in the line of duty.Their lives and those of their wife and fiancée are more worthy subjects of movies than that of their murderers. A recent article in the Tyler Morning Telegraph by Faith Harper noted that H.D. Murphy and Maree Tullis were high school sweethearts who graduated from Alto (Texas) High School. He was accepted into the Texas Department of Public Safety and the two planned to marry and move to Fort Worth. On Easter morning, April 1, 1934, he met his death at the hands of the infamous criminals. Maree Tullis wore her white wedding dress to his funeral. She never married and died in 1978. Ed Wheeler had been married for two years. That Easter morning his wife, Doris, became a widow at the age of 23. There were no benefits for families of officers killed in the line of duty, but she landed a job with the State Department of Transportation. Later she did some undercover work with the Texas Rangers. She was sworn in as a Ranger and would enter gambling establishments throughout the state to witness the gaming before other officers would enter and close the places down. She met Ed Wheeler when he stopped her for having a tail light burned out. She said in an interview years later that her car’s lights were just fine. Ed had stopped her to introduce himself and to get her name. It worked! 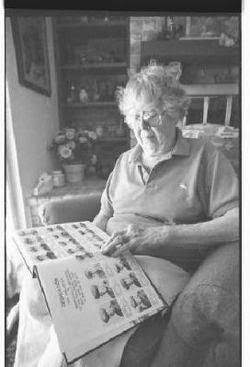 Doris died in 2007, outspoken in her belief that the murderers should never have been glorified in movies. History is often kinder to the bad guys than to the good. This is one of those cases. Maybe someday a movie producer will decide to tell the story of the heroes instead of the vicious and destructive lives of Bonnie and Clyde and their gang. You are right. Hollywood has a way of glorifying killers.Unfortunately, the victims are rarely remembered.